In music, a fugue [fjuːg]) is a type of counterpoint or contrapuntal composition. It begins with a theme stated by one of the voices playing alone. A second voice then enters and plays the same theme, while the first voice continues on with a contrapuntal accompaniment. The remaining voices enter one by one, each beginning by stating the same theme. The remainder of the fugue develops the material further using all of the voices and, usually, multiple statements of the theme. The form evolved during the seventeenth century from several earlier types of contrapuntal compositions such as ricercars, capriccios, canzonas, and fantasias. Middle and late Baroque composers such as Dieterich Buxtehude (1637–1707) and Johann Pachelbel (1653–1706) contributed greatly to the development of the fugue, and the form reached ultimate maturity in the works of Johann Sebastian Bach (1685–1750). With the decline of typical Baroque counterpoint after Bach's death, the sonata form replaced the fugue as the most widely used musical form. The fugue never again reached the level of popularity it had in the Baroque era, although most composers still used fugues from time to time, and some (Anton Reicha (1770–1836), Dmitri Shostakovich (1906–1975)) wrote whole cycles of fugues. Felix Mendelssohn (1809–1847) was also a prolific composer of fugues that bore a strong connection to Bach's style while still being fresh and original. Mozart's fugues are equally if not more adherent to the baroque idiom. 2 Is the fugue a musical form? The word fugue comes from the Latin fuga (flight) and fugere (to flee). Variants include fughetta (a small fugue) and fugato (a work or section of a work resembling a fugue but not necessarily adhering to the rules of one). The adjectival form of fugue is fugal. The number of voices in a fugue generally ranges from three to five, but eight or even ten voices are possible in large choral or orchestral fugues. Fugues in fewer than three voices are rare, because with two voices the subject can only jump back and forth between the upper and lower voice. The best-known example of a two-voice work is the E minor fugue from Book I of Johann Sebastian Bach's Well-Tempered Clavier. Two part works which are written in a fugal manner are sometimes called "inventions." The term "part" is often used in the context of the fugue as a synonym for "voice." Use of the term "voice" does not imply that the fugue in question is necessarily composed for voices rather than instruments. The beginning of the fugue tends to be written to definite rules, whereas in the later portions the composer has considerably greater freedom. A fugue begins with an exposition of its subject by one of the voices in the tonic key. After the subject, a second voice "answers" it with the same theme as the subject, but played in the dominant, although the tonic or subdominant (see Bach's "Toccata and Fugue in D minor, BWV 565) are also occasionally used. An answer can be classified as either tonal or real. In a tonal answer, some of the intervals may be altered to keep the answer in the same key. In a real answer, the subject is literally transposed to another key. As the answer is passed to each new voice, the prior voice will sometimes accompany the subject with a counter-subject. It is customary for the exposition to alternate subjects (S) with answers (A) as follows: SASA. Occasionally in some fugues the order is varied: e.g., SAAS of the first fugue in Bach's Well-Tempered Clavier. The fugue's exposition concludes when all voices have stated or answered the subject. The fugue rarely stops after its initial exposition, more often continuing to one or more developmental episodes. Episodic material is usually based upon some element of the exposition. For example, a melodic motif may be taken and repeated sequentially. There may also be middle entries: these are entries of the subject by fewer than all the voices in the fugue, often varied in some way. They are often given in keys other than the tonic or dominant, or in a different mode (minor instead of major, or vice versa). The episodes may also vary the subject by presenting it in inversion (upside-down), retrograde (back-to-front), diminution (with shorter note values) or augmentation (with longer note values; the subject in augmentation entering in the bass is common at the end of fugues). Sometimes the voices appear in stretto, with one voice entering with the subject before the last voice has finished its entry. There also may be false entries, which begin the fugue subject, but do not give it in full (the isolated beginning is sometimes called the head motif). Episodes may be interspersed with repeated expositions in which all voices give subjects and answers as at the beginning of the fugue, although these may also be varied, for example by having the voices enter in a different order. Various devices are used to form the conclusion of a fugue. A fugue may end with a recapitulation, in which the entries of the subject are repeated in the manner it was first introduced. Stretto entries of the subject often are found near the end, usually at the point where the fugue reaches its climax of tension. The final section often includes a pedal point, either on the dominant or the tonic note. At the very end of the fugue there may be a coda section, which follows a strong cadence on the tonic chord. The construction of a fugue is based on taking advantage of "contrapuntal devices" as Johann Sebastian Bach called them, places where an entrance of a theme or subject could occur. In each fugue theme, then, there is an implied structure of where and at what intervals the theme can begin in another voice. Bach had sufficient expertise in that he could tell exactly what entrances could occur simply by hearing the first playing of a theme. A fugue is in 'stretto', at any statement of the subject, if an answer begins before the subject is completely stated. A double fugue has two subjects that are often developed simultaneously. Sometimes the second subject is initially presented as the counter-subject of the first, while in other examples, the second subject has its own exposition. In the latter case, the work has this structure: fugue on subject A; fugue on subject B; combination of subjects A and B. In a few cases, the second (and third, and so on) subjects may have their presentation cleverly woven into the development (see Bach C# minor WTC I, a triple fugue). Examples of the double fugue are the Bach A major WTC I and g# minor WTC II (External links to Shockwave movie). The fugue that accompanies Bach's well-known "Toccata in D minor" for organ is a double fugue. While triple fugues are not uncommon (see Bach c# minor WTC I and f# minor WTC II), quadruple fugues are rare. 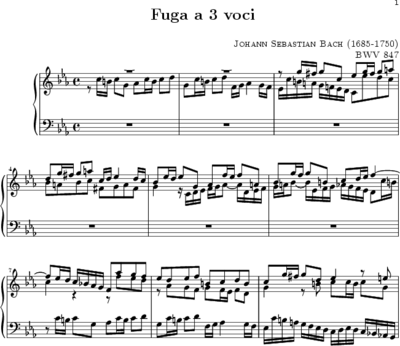 The surviving pages of Contrapunctus XIV from Bach's Die Kunst der Fuge represent a triple fugue that was undoubtedly quadruple in conception. Other examples of quadruple fugues are the fuga IV (a quattro soggetti) from Ferruccio Busoni's Fantasia Contrappuntistica and in a similar respect, the quadruple fugue from Kaikhosru Shapurji Sorabji's Opus Clavicembalisticum. Also called a counter-fugue, a pair of mirror fugues consisting of a rectus and an inversus presents and develops a subject and its melodic inversion. Where the subject ascends, the mirror descends, and vice versa. Voice entries are also mirrored: where a voice enters first in the rectus, it will enter last in the inversus; where a soprano voice states a subject or counter subject in the rectus, a bass voice will state the same material in the inversus. Tonal functions are also mirrored; tonic pitches are replaced by dominants and dominants by tonics. Modulations are also mirrored; where the rectus modulates to the dominant, the inversus will modulate to the subdominant; when the rectus modulates to the mediant, the inversus modulates to the submediant, etc. Sequences and cadences are likewise mirrored. One common fugue technique is permutation, where subjects and countersubjects can be rearranged in various orders so that all of their countless vertical arrangements can be explored while maintaining good counterpoint and voice-leading. This technique is efficient but difficult because certain intervals must be avoided, such as in a three voice fugue, a fourth between the bass and alto forming a non-cadential second inversion harmony. A permutation fugue with a subject and two countersubjects (called A, B, and C, respectively) will state every subject in every voice. By the end of the fugue, every permutation of arranging these subjects among the various voices will have been exhausted so that (if the first letter represents the soprano voice, the second, the alto, and the third, the bass) the composer has presented ABC, ACB, BAC, BCA, CAB, CBA (but not necessarily in that order, and often interrupted by episodic material). For the classic example of the permutation fugue, see Fugue No. 2 in C from the Well-Tempered Clavier. Bach favored the permutation fugue early in his career for its economy and elegance, although later he largely abandoned this form. Is the fugue a musical form? A widespread view of the fugue is that it is not a musical form (in the sense that a sonata form is) but rather a technique of composition. For instance, Donald Tovey wrote that "Fugue is not so much a musical form as a musical texture," that can be introduced anywhere as a distinctive and recognizable technique, often to produce intensification in musical development. On the other hand, composers almost never write music in a purely cumulative fashion, and usually a work will have some kind of overall formal organization, hence the rough outline given above, involving the exposition, the sequence of episodes, and the concluding coda. When scholars say that the fugue is not a musical form, what is usually meant is that there is no one single formal outline into which all fugues reliably can be fitted. Ratz argues that the formal organization of a fugue involves not only the arrangement of its theme and episodes, but also its harmonic structure. In particular, the exposition and coda tend to emphasize the tonic key, whereas the episodes usually explore more distant tonalities. However, it is to be noted that while certain related keys are more commonly explored in fugal development, the overall structure of a fugue does not limit its harmonic structure as much as Ratz would have us believe. For example, a fugue may not even explore the dominant, one of the most closely related keys to the tonic. Bach's Fugue in Bb from the Well Tempered Clavier explores the relative minor, the supertonic, and the subdominant. This is unlike later forms such as the sonata, which clearly prescribes which keys are explored (typically the tonic and dominant in an ABA form). Fugues are also not limited in the way the exposition is structured, the number of expositions in related keys, or the number of episodes (if any). So, the fugue may be considered a compositional practice rather than a compositional form, similar to the invention. The fugue, like the invention and sinfonia, employs a basic melodic subject and spins out additional melodic material from it to develop an entire piece. Fugual technique is really just a way to develop pieces of a particular contrapuntal style. The term fuga was used as far back as the Middle Ages, but was initially used to refer to any kind of imitative counterpoint, including canons, which are now thought of as distinct from fugues. It was not until the 16th century that fugal technique as it is understood today began to be seen in pieces, both instrumental and vocal. Fugal writing is found in works such as fantasias, ricercares and canzonas. The fugue arose from the technique of "imitation," where the same musical material was repeated starting on a different note. Originally this was to aid improvisation, but by the 1550s, it was considered a technique of composition. The Renaissance composer Giovanni Pierluigi da Palestrina (1525-1594) wrote masses using modal counterpoint and imitation, and fugal writing became the basis for writing motets as well. Palestrina's imitative motets differed from fugues in that each phrase of the text had a different subject which was introduced and worked out separately, whereas a fugue continued working with the same subject or subjects throughout the entire length of the piece. It was in the Baroque period that the writing of fugues became central to composition, in part as a demonstration of compositional expertise. Fugues were incorporated into a variety of musical forms. Jan Pieterszoon Sweelinck, Girolamo Frescobaldi, Johann Jakob Froberger and Dieterich Buxtehude all wrote fugues, and George Frideric Handel included them in many of his oratorios. Keyboard suites from this time often conclude with a fugal gigue. The French overture featured a quick fugal section after a slow introduction. The second movement of a sonata da chiesa, as written by Arcangelo Corelli and others, was usually fugal. The Baroque period also saw a rise in the importance of music theory. The most influential text, Gradus Ad Parnassum ("Steps to Parnassus"), by Johann Joseph Fux (1660-1741), appeared in 1725. This work laid out the terms of "species" of counterpoint, and offered a series of exercises to learn fugue writing. Fux's work was largely based on the practice of Palestrina's modal fugues. It remained influential into the nineteenth century. Joseph Haydn, for example, taught counterpoint from his own summary of Fux, and thought of it as the basis for formal structure. Johann Sebastian Bach (1685-1750) is generally regarded as the greatest composer of fugues. He often entered into contests where he would be given a subject with which to spontaneously improvise a fugue on the organ or harpsichord. This musical form was also apparent in chamber music he would later compose for Weimar. The famous Concerto for Two Violins in D Minor (BWV 1043) (although not contrapuntal in its entirety) has a fugal opening section to its first movement. Bach's most famous fugues are those for the harpsichord in The Well-Tempered Clavier, the Art of Fugue, and his organ fugues, which are usually preceded by a prelude or toccata. The Art of Fugue is a collection of fugues (and four canons) on a single theme that is gradually transformed as the cycle progresses. The Well-Tempered Clavier comprises two volumes written in different times of Bach's life, each comprising 24 prelude and fugue pairs, one for each major and minor key. Bach also wrote smaller single fugues, and incorporated fugal writing in many of his works that were not fugues per se. Although J. S. Bach was not well known as a composer in his lifetime, his influence extended forward through his son Carl Philipp Emanuel Bach and through the theorist Friedrich Wilhelm Marpurg (1718-1795) whose Abhandlung von der Fuge ("Treatise on the fugue," 1753) was largely based on J. S. Bach's work. During the Classical era, the fugue was no longer a central or even fully natural mode of musical composition. Nevertheless, the three greatest composers of the Classical era, Joseph Haydn, Wolfgang Amadeus Mozart, and Ludwig van Beethoven, all had periods of their careers in which they in some sense "rediscovered" fugal writing and used it frequently in their work. Haydn's most famous fugues can be found in his Sun quartets, (op. 20, 1772) of which three have fugal finales. This was a practice that Haydn repeated only once later in his quartet-writing career, with the finale of his quartet Op. 50 no. 4 (1787). Some of the earliest examples of Haydn's use of counterpoint, however, are in three symphonies (Symphony No. 3, Symphony No. 13, and Symphony No. 40) that date from 1762-63. Each one of these symphonies includes a fully-developed fugue as the finale. The only other symphony with a fugal finale is Symphony No. 70 from 1779. The earliest fugues, in both the symphonies and in the baryton trios, exhibit the influence of Joseph Fux's treatise on counterpoint, Gradus ad Parnassum (1725), which Haydn studied carefully. Haydn's second fugal period occurred after he heard, and was greatly inspired by, the oratorios of Handel during his visits to London (1791-1793, 1794-1795). Haydn then studied Handel's techniques and incorporated Handelian fugal writing into the choruses of his mature oratorios The Creation and The Seasons, as well as several of his later symphonies, including Symphony No. 88, Symphony No. 95, and Symphony No. 101. Haydn's use of counterpoint late in his career is restricted primarily to sections of fugato, rather than fully-developed fugal forms. Mozart studied counterpoint when young with Padre Martini in Rome. However, the major impetus to fugal writing for Mozart was the influence of Baron Gottfried van Swieten in Vienna around 1782. Van Swieten, during diplomatic service in Berlin, had taken the opportunity to collect as many manuscripts by Bach and Handel as he could, and he invited Mozart to study his collection and also encouraged him to transcribe various works for other combinations of instruments. Mozart was evidently fascinated by these works, and wrote a set of transcriptions for string trio of fugues from Bach's 'Well-Tempered Clavier', introducing them with preludes of his own. Mozart then set to writing fugues on his own, mimicking the Baroque style. These included the fugues for string quartet, K. 405 (1782) and a fugue in C Minor K. 426 for two pianos (1783). Later, Mozart incorporated fugal writing into the finale of his Symphony No. 41 and his opera Die Zauberflöte. The parts of the 'Requiem' he completed also contain several fugues most notably the Kyrie, and the three fugues in the Domine Jesu. He also left behind a sketch for an 'Amen' fugue which would have come at the end of the Sequentia. Beethoven was familiar with fugal writing from childhood, as an important part of his training was playing from The Well-Tempered Clavier. During his early career in Vienna, Beethoven attracted notice for his performance of these fugues. There are fugal sections in Beethoven's early piano sonatas, and fugal writing is to be found in the second and fourth movements of the Symphony No. 3 (Eroica Symphony) (1805). Nevertheless, fugues did not take on a truly central role in Beethoven's work until his "late period." A fugue forms the development section of the last movement of his piano sonata op. 101 (1816), and massive, dissonant fugues form the finales of his Piano Sonata No. 29 (Hammerklavier) piano sonata (1818) and String Quartet No. 13 (string quartet op. 130 1825). The latter was later published separately as op. 133, the Grosse Fuge ("Great Fugue"). Beethoven's last piano sonata, op. 111 (1822) integrates fugal texture throughout the first movement, written in sonata form. Fugues are also found in the Missa Solemnis and in the finale of the Symphony Ninth Symphony. A common characteristic of the Classical composers is that they usually wrote fugues not as isolated works but as part of a larger work, often as a sonata-form development section or as a finale. It was also characteristic to abandon fugal texture just before the end of a work, providing a purely homophonic resolution. This is found, for instance, in the final fugue of the chorus "The Heavens are Telling" in Haydn's The Creation (1798) and the final fugal section of Beethoven's piano sonata op. 110 (1822). By the beginning of the Romantic era, fugue writing had become specifically attached to the norms and styles of the Baroque. One manual explicitly stated that the hallmark of contrapuntal style was the style of J. S. Bach. The 19th century's taste for academicism - setting of forms and norms by explicit rules - found Friedrich Wilhelm Marpurg, and the fugue, to be a congenial topic. The writing of fugues also remained an important part of musical education throughout the 19th century, particularly with the publication of the complete works of Bach and Handel, and the revival of interest in Bach's music. Examples of fugal writing in the Romantic era are found in the last movement of Berlioz's Symphonie Fantastique, and Wagner's Die Meistersinger von Nürnberg|Meistersinger, in particular the conclusion of the second act. The finale of Giuseppe Verdi's opera Falstaff (opera)|Falstaff is a ten-voice fugue. Felix Mendelssohn was obsessed with fugal writing, as it can be found prominently in the Scottish Symphony, Italian Symphony, and the Hebrides Overture. Robert Schumann, and Johannes Brahms also included fugues in many of their works. The final part of Schumann's Piano Quintet (Schumann)|Piano Quintet is a double fugue, and his opus numbers 126, 72 and 60 are all sets of fugues for the piano (opus 60 based on the BACH motif). The recapitulation of Liszt's B minor sonata is cast in the form of a 3-part fugue. The Quasi-Faust movement of Charles-Valentin Alkan's Grande Sonate contains a bizarre but musically convincing fugue in 8 parts. Brahms' Variations and Fugue on a Theme of Handel ends with a fugue, as does his Cello Sonata No. 1 (Brahms)|Cello Sonata No. 1. Towards the end of the Romantic era, Richard Strauss included a fugue in his tone poem, Also sprach Zarathustra (Strauss)|Also sprach Zarathustra, to represent the high intelligence of science. Sergei Rachmaninoff, despite writing in a lush post-romantic idiom, was highly skilled in counterpoint (as is highly evident in his Vespers); a well known fugue occurs in his Symphony No. 2 (Rachmaninoff)|Symphony No. 2. Alexander Glazunov wrote a very difficult Prelude and Fugue in D minor, his Op. 62, for the piano. The late Romantic composer Max Reger had the closest association with the fugue among his contemporaries. Many of his organ works contain, or are themselves fugues. Two of Reger's most-played orchestral works, the Hiller variations and the Mozart variations, end with a large-scale orchestral fugue. A number of other twentieth century composers made extensive use of the fugue. Béla Bartók opened his Music for Strings, Percussion and Celesta with a fugue in which the tritone, rather than the fifth, is the main structural interval. He also included fugal sections in the final movements of his String Quartet No. 1 (Bartók)|String Quartet No. 1, String Quartet No. 5 (Bartók)|String Quartet No. 5, Concerto for Orchestra, and Piano Concerto No. 3 (Bartók)|Piano Concerto No. 3. The second movement of his Sonata for Solo Violin (Bartók)|Sonata for Solo Violin is also a fugue. The Czech composer Jaromir Weinberger studied the fugue form with Max Reger, and had an uncommonly facile skill in fugal writing. The fugue of the "Polka and Fugue" from his opera "Schwanda the Bagpiper" is a superb example. Igor Stravinsky also incorporated fugues into his works, including the Symphony of Psalms and the Concerto in E-flat (Dumbarton Oaks) concerto. The last movement of Samuel Barber's famous Sonata for Piano is a sort of "modernized" fugue, which, instead of obeying the constraint of a fixed number of voices, develops the fugue subject and its head-motif in various contrapuntal situations. In a different direction, the tonal fugue movement of Charles Ives' fourth symphony evokes a nostalgia for an older, halcyon time. The practice of writing fugue cycles in the manner of Bach's Well-Tempered Clavier was perpetuated by Paul Hindemith in his Ludus Tonalis, Kaikhosru Sorabji in a number of his works including the Opus clavicembalisticum, and Dmitri Shostakovich in his 24 Preludes and Fugues, opus 87 (which, like the Well-Tempered Clavier, contains a prelude and fugue in each key, although the order of Shostakovich's pieces follows the cycle of fifths, whereas Bach's progressed chromatically). Benjamin Britten composed a fugue for orchestra in his The Young Person's Guide to the Orchestra, consisting of subject entries by each instrument once. Leonard Bernstein wrote a "Cool Fugue" as part of his musical West Side Story, and the musical comedy composer Frank Loesser included a Fugue for Tinhorns in his musical Guys and Dolls. Jazz musician Alec Templeton even wrote a fugue (recorded subsequently by Benny Goodman): Bach Goes to Town. Several 'Bachianas Brasileiras' of Heitor Villa-Lobos feature a fugue as one of the movements. Ástor Piazzolla also wrote a number of fugues in his Nuevo tango style. György Ligeti wrote a Fugue for his "Requiem" (1966), which consists of a 5 part fugue in which each part (S,M,A,T,B) is subsequently divided in four voices that make a canon. 20th Century fugue writing explored many of the directions implied by Beethoven's 'Grosse Fuge', and what came to be termed "free counterpoint" as well as "dissonant counterpoint." Fugal technique as described by Marpurg became part of the theoretical basis for Schoenberg's 'twelve-tone technique'. Fugue is the most complex of contrapuntal forms and, as such, gifted composers have used it to express the profound. The complexity of the fugue has foiled lesser composers who have produced only the banal. The philosopher Theodor Adorno, a skilled pianist and interpreter of Beethoven's music, expressed a sense of the arduousness and also the inauthenticity of modern fugue composition, or any composing of fugue in a contemporary context, i.e., as an anachronism. Adorno's conservative and historically bound view of Bach is not found among most modern fugue composers, such as David Diamond, Paul Hindemith or Dmitri Shostakovich. The most classicist fugues that have appeared after Beethoven are those of Felix Mendelssohn, who as a child impressed Johann Wolfgang von Goethe and others with his mastery of counterpoint while improvising at the piano. In the words of the Austrian musicologist Erwin Ratz (1951, 259), "fugal technique significantly burdens the shaping of musical ideas, and it was given only to the greatest geniuses, such as Bach and Beethoven, to breathe life into such an unwieldy form and make it the bearer of the highest thoughts." In presenting Bach's fugues as among the greatest of contrapuntal works, Peter Kivy (1990) points out in Music Alone: Philosophical Reflections on the Purely Musical Experience that "counterpoint itself, since time out of mind, has been associated in the thinking of musicians with the profound and the serious" and argues that "there seems to be some rational justification for their doing so." Because of the way the fugue is often taught, the form can be seen as dry and filled with laborious technical exercises. The term "school fugue" is used for a very strict form of the fugue that was created to facilitate teaching. The works of the Austrian composer Simon Sechter, who was a teacher of Franz Schubert and Anton Bruckner, include several thousand fugues, but they are not found in the standard repertory, not because they are fugues but because of Sechter's limitations as a musical artist. Others, such as Alfred Mann, argued that fugue writing, by focusing the compositional process actually improves or disciplines the composer towards musical ideas. This is related to the idea that restrictions create freedom for the composer, by directing their efforts. He also points out that fugue writing has its roots in improvisation, and was, during the baroque, practiced as an improvisatory art. The fugue is perceived, then, not merely as itself, but in relation to the idea of the fugue, and the greatest of examples from the Baroque era forward. The fugue is a musical idea with a history, which includes its use in liturgical music of Christianity, as a device in teaching composition, as a favored form by one of the greatest, if not the greatest, composer of European classical music, and as a form which can be thought of as distinctly antique. There are a whole range of expectations brought to bear on any piece of music labeled "fugue." Kivy, Peter. Music Alone: Philosophical Reflections on the Purely Musical Experience. Ithaca: Cornell University Press, 1990. ISBN 0801423317. 206, 210. Ratz, Erwin. "Einführung in die Musikalische Formenlehre: Über Formprinzipien in den Inventionen J. S. Bachs und ihre Bedeutung für die Kompositionstechnik Beethovens." Introduction to Musical Form: On the Principles of Form in J. S. Bach's Inventions and their Import for Beethoven's Compositional Technique, first edition with supplementary volume. Vienna: Österreichischer Bundesverlag für Unterricht, Wissenschaft und Kunst, 1951. Fugue Treatises, Analyses and Tools, kunstederfuge. Fugues and Fugue Sets, Dean's Den. This page was last modified on 15 May 2017, at 21:01.